Cinnamon Marshmallows | "Il faut goûter"
I’m confectionerially excited! Again! This time, it’s seasonably sweet and spicy. 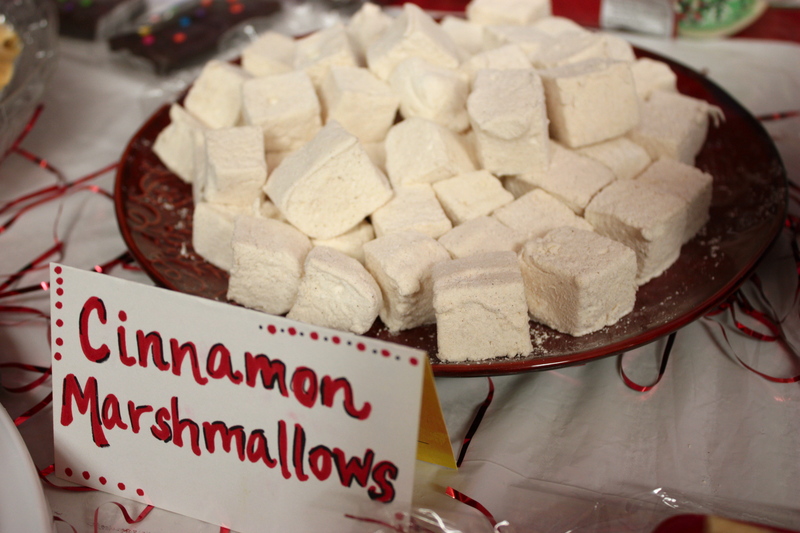 My Cinnamon Marshmallows made their debut at the Putnam County Library staff’s holiday potluck today. They were fluffy little one-bites amid the decadent cakes, pies, and brownies baked by my coworkers. Delicious, everyone! This recipe is similar to my Mint-Basil Marshmallows, this time flavored with cinnamon (oil and the ground stuff). You’ll get a soft, pillowy, heavenly texture that a store-bought marshmallow just doesn’t achieve. They’re quite the nice sweet treat. Also, this morning confirmed that they taste AMAZING melting atop a winter mug of hot chocolate. How awesome would a little hot chocolate gathering be? 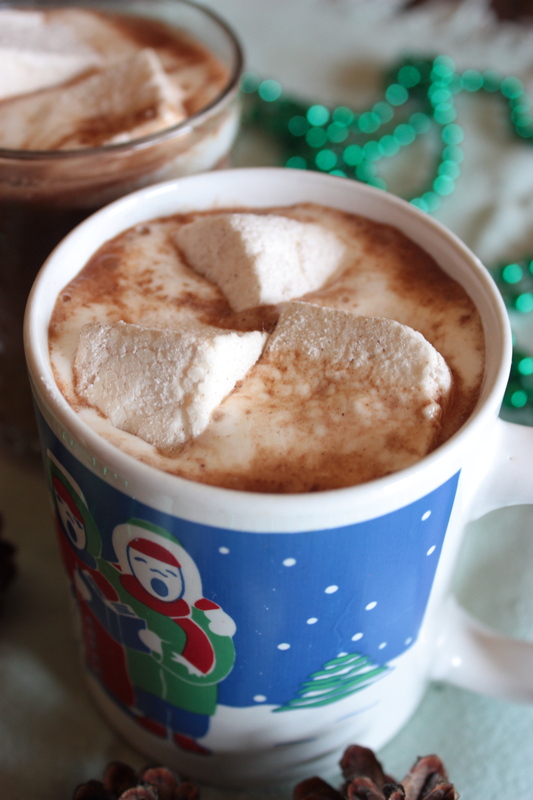 You could have cinnamon marshmallows, mint marshmallows, and perhaps raspberry or orange-flavored marshmallows for the melting and sipping. If I had time to think about yet another holiday gathering, I’d plan that one! Now is the perfect time to make these marshmallows for some special people. Your coworkers. Your child’s school Christmas party. Or your favorite friendly marshmallow fiend (do you have one of those?). In any case, make them for yourself and have a nice hot chocolate…maybe in the bathtub. Visit my previous Mint-Basil Marshmallow post to see more process photos and find out why you should try making homemade marshmallows! 1. Place the gelatin into the bowl of a stand mixer along with 1/2 cup of the water. Let this mixture sit while you do step 2. Have the whisk attachment attached and ready to use. 2. In a small saucepan, combine the remaining 1/2 cup water, granulated sugar, corn syrup, and salt. Place over medium high heat, cover and allow to cook for 3 to 4 minutes. Uncover, clip a candy thermometer onto the side of the pan and continue to cook until the mixture reaches 240 degrees F (soft ball stage), approximately 7 to 8 minutes. Once the mixture reaches this temperature, immediately remove from the heat. 3. Turn the mixer on low speed and, while running, slowly pour the sugar syrup down the side of the bowl into the gelatin mixture. Once you have added all of the syrup, increase the speed to high. Continue to whip until the mixture becomes very thick and is lukewarm, approximately 12 to 15 minutes. 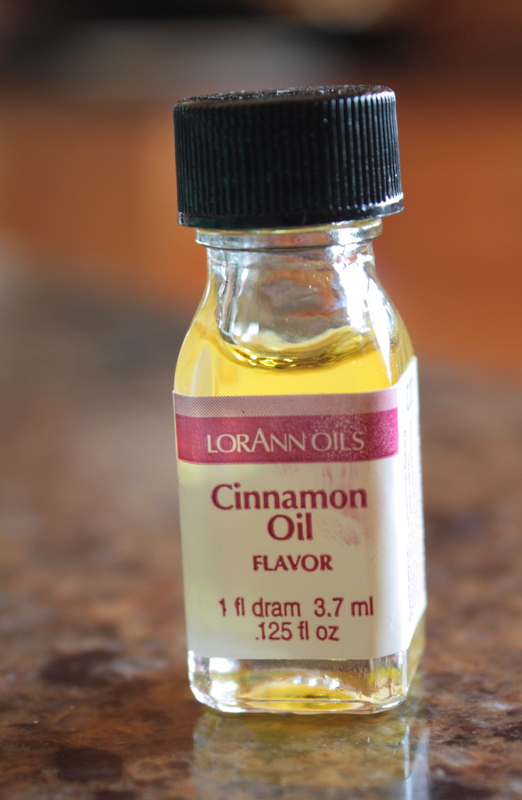 Add the vanilla and cinnamon oil during the last minute of whipping. While the mixture is whipping, prepare the pan as follows (step 4). 4. Combine the confectioners’ sugar, cornstarch, and cinnamon in a small bowl. Lightly spray a 13 by 9-inch metal baking pan with nonstick cooking spray on bottom and sides. Add the sugar and cornstarch mixture and move around to completely coat the bottom and sides of the pan. Return the remaining mixture to the bowl for later use. 5. When the marshmallow cream mixture is ready, pour it into the prepared pan, then use a lightly oiled spatula to spread it evenly. *OR, with slightly wet or oiled fingers, you can press the mixture to even it out and your fingers won’t stick to the mixture! * Dust the top with enough of the remaining sugar and cornstarch mixture to lightly cover. Reserve the rest for later. Allow the marshmallows to sit uncovered for at least 4 hours and up to overnight. 6. After at least 4 hours, turn the marshmallows out onto a cutting board (coated with the confectioners’ sugar/cornstarch mixture if you didn’t coat the top with enough) and cut into 1-inch squares using a pizza wheel dusted with the confectioners’ sugar mixture. 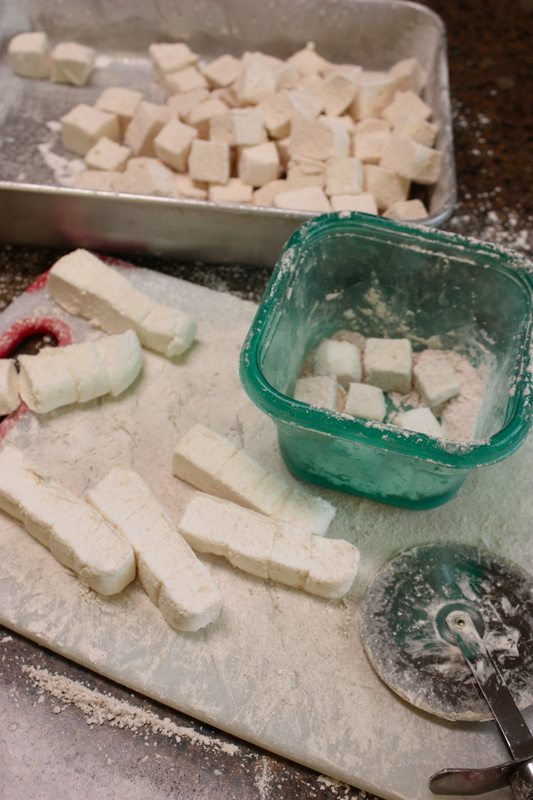 Once cut, lightly dust all sides of each marshmallow with the remaining mixture, using additional if necessary (you might have to make up more powdered sugar/cornstarch/cinnamon mixture). Store marshmallows in an airtight container for up to 3 weeks. This entry was posted in Sweet and tagged Christmas confections, cinnamon marshmallows, Cooking, food, homemade marshmallows, recipe by needtotaste. Bookmark the permalink. Oh those look so wonderful in those coffee mugs!